The original Deemster light car was a development of the Wilkinson which used the same 844cc 4-cylinder engine that powered the company's Wilkinson T.M.C. motorcycles. This had been introduced in 1912, but in January 1914 both motorcycle and car had been discontinued and the car design taken over by a new company, the Ogston Motor Co. headed by Scotsman J.N. Ogston. He originally planned to use his own name for the car, but by the time it appeared in April 1914 it had been rechristened Deemster, the name given to a judge in the Isle of Man. In 1923 there were plans to make the Deemster in America and the Deemster Corp of Hazleton, Pennsylvania was set up. 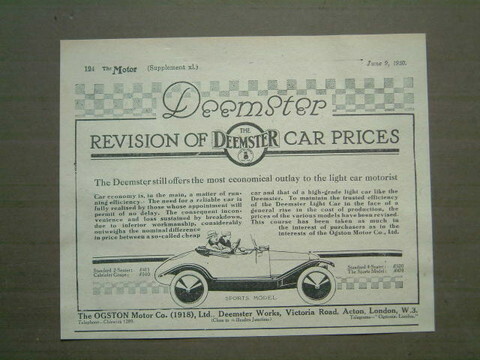 Only one American Deemster was made, and it may as well have come from Acton though the track was 2 inches wider.